Set to mirror his Northern Hemisphere success High Chaparral's top class dual Group I winning son Toronado (IRE) (pictured) has now had 3 individual 2YO winners producing 4 wins. On Saturday 30th March Prince Of Sussex, opened his winning account in Saturday's $250,000 VOBIS Gold Rush at Bendigo. Under a perfect ride from Michael Dee who eased him down on the post to win by two and a quarter from The Executioner with the Fighting Sun colt Groot a length back in third. Heaven's Bonus is a 2YO gelding by Toronado out of the Stratum mare, Heaven's Choice. He has had 4 starts for 2 wins with the latest start being 5 days ago when 1st at Launceston on March 27, 2019 in the Tasmanian Sires Produce over 1400 metres. To kick of Toronados Southern Hemisphere success was the Paul Messara trained Powertrain. Powertrain's lead all the way and he came under extreme pressure from the I Am Invincible colt Vici who looked to put a neck on Powertrain at the 200 metres before the Toronado gelding rallied to win by a neck with Deviate two and a quarter lengths back in third. The highest rated miler in Europe in 2015 (Time form Rating of 131) - Toronado has 24 2YO winner from his first Northern Hemisphere crop including 5 Group performers in Revelstoke, Watan, Almufti and Listed performer Baylagan and EL Ingrato. Based on his winning results so far in Australia expectations are high that Toronado will mirror his Northern Hemisphere success here. 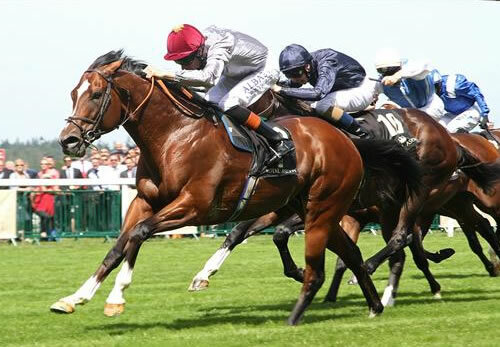 One thing we have noted is that Toronado, as all good stallions do, has really stamped is progeny. They are strong well balance extremely athletic individuals that carry that X factor and the colt we are offering is a prime example. We are in the position to offer a stunning Toronado Colt out of Chabaud for syndication. Shares in the Toronado Colt ex Chabaud colt start at 2.5% $3,300 inclusive. Please contact neill@championthoroughbreds.com.au for more details. Sacred Falls youngsters are starting to come to the fore with a couple of very impressive trial winners over the last 5 days. One of them bred on that fantastic O'Reilly Pins cross. Win A Free Share In Our Scissor Kick x Iguana Jo Colt! To celebrate our 10 year anniversary, we're giving away a 5% share in our well-related Scissor Kick x Iguana Jo colt recently purchased at the Adelaide Magic Millions Sale. The Prize includes all expenses paid for 24 months for one lucky owner who has purchased a share of 5% or more in any of our 2019 yearlings. The prize (5% share) will be drawn at our 10th Anniversary Party on Saturday August 10th.